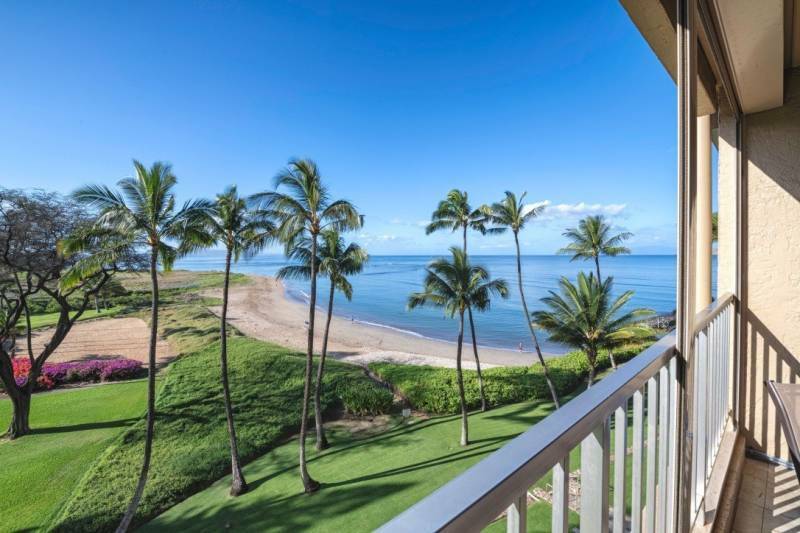 Looking for a 2-bedroom oceanfront Kihei condo with views from your bedroom, living room, and lanai? Care to start your day with a dip in the ocean, sunbathe at the pool then have lunch on a rooftop deck without ever leaving home? 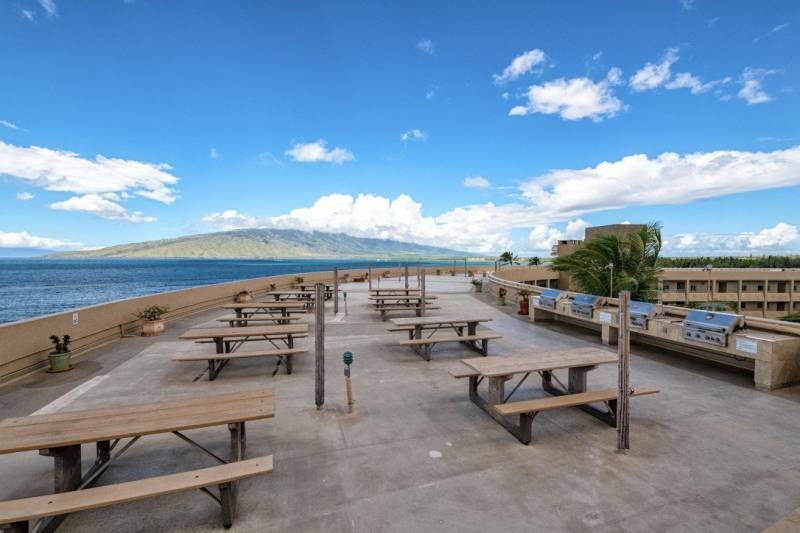 If this sounds like your flavor of shave ice, you’ll love this newly listed, oceanfront Kihei, Maui property. 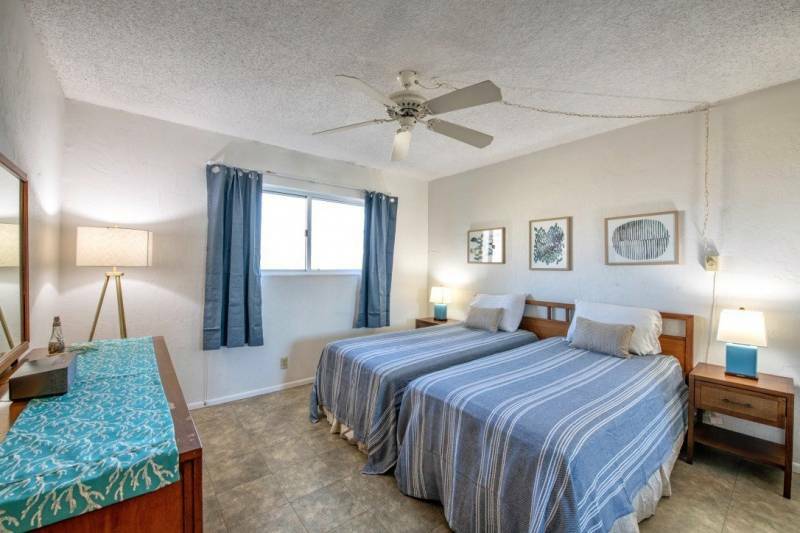 Featuring a split air conditioning system in every room, this popular vacation rental exudes comfort. From the moment you step inside, you’re greeted by beach-lined ocean views. With 885 sq.ft. of living space, 2 bedrooms and 2 full bathrooms, this home has plenty of space for your whole group to relax. Imagine waking up, opening your eyes and sitting up to the sight of waves rolling across the sand. No, this is not a dream. This is the reality from the master bedroom. With private access to the lanai, step out and relish in the calm, quiet morning hours in this desirable South Maui community. The recently refreshed 2nd bedroom offers plenty of space for 2 twin beds, ideal for families with children. 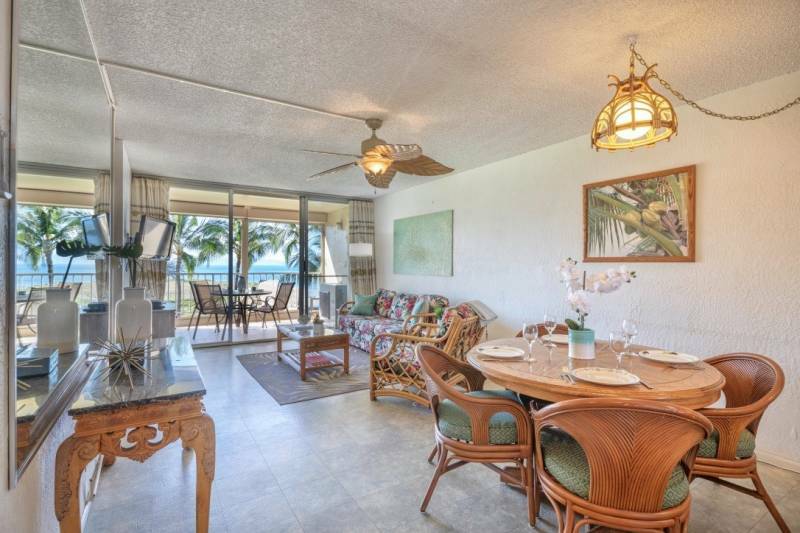 Unit #521 is located on the southwest facing side of Menehune Shores. Only doors down from the nearest elevator, it provides easy access to both the rooftop deck and the manicured lawn leading to the beach. 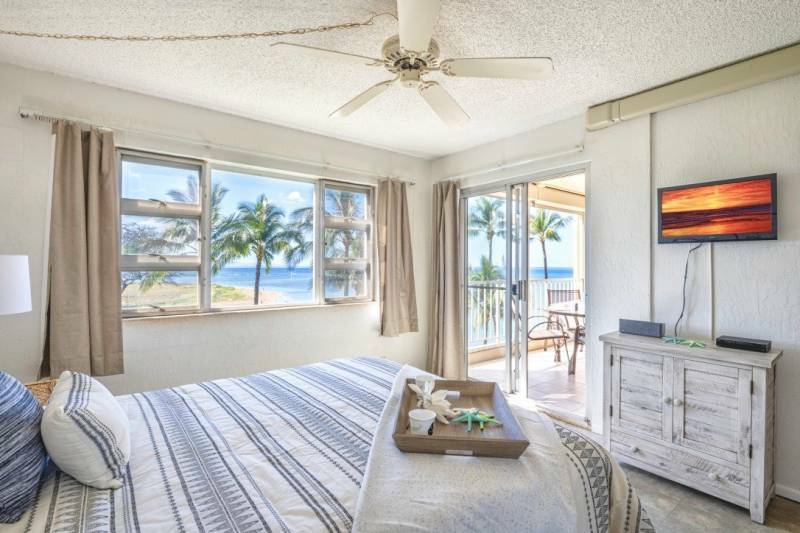 As South Maui’s trade winds typically blow from the north, this location provides an excellent cross breeze from the front door and through the living room. Simply keep the security screen door closed and enjoy the cooling winds. As the afternoons roll on, you can soak in the views without having direct sunlight flooding your living room. Enjoy the pool and restaurant on the opposite side of the complex, then return to your quiet 5th floor home for sunset. Days at Menehune Shores are the very essence of what you dream of when picturing a Maui lifestyle. Offering the following resort-like amenities, it’s easy to unpack your suitcase and never want to leave. For those wanting to explore the many diverse landscapes, beaches, and activities throughout the island, this location is ideal. 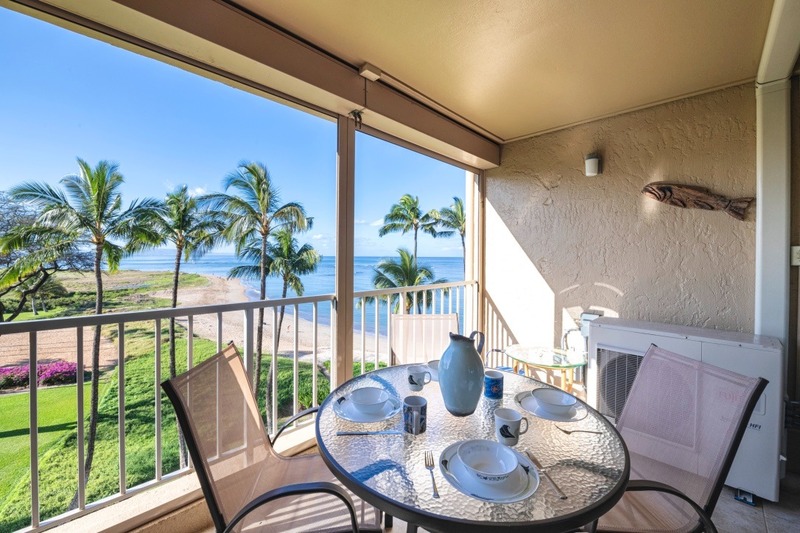 For additional information, see Menehune Shores – Oceanfront North Kihei at its Best. At the time of this writing, there is an extremely short supply of properties like this. Seeing that the unit next door recently sold for $849,000, receiving a full price offer after just 3 days on the market, #521 offers incredible value. If you would like to preview this unit in person, contact your Realtor to schedule a showing. If you do not currently have representation, call me. I would be happy to help answer your questions or show you around.